President Abdulla Yameen Abdul Gayoom has participated in a function held at Lh. Kurendhoo to mark the completion of the Coastal Protection Project run on the island. Yameen, who is on a tour of several islands in Lh. Atoll visited Kurendhoo this Saturday morning. 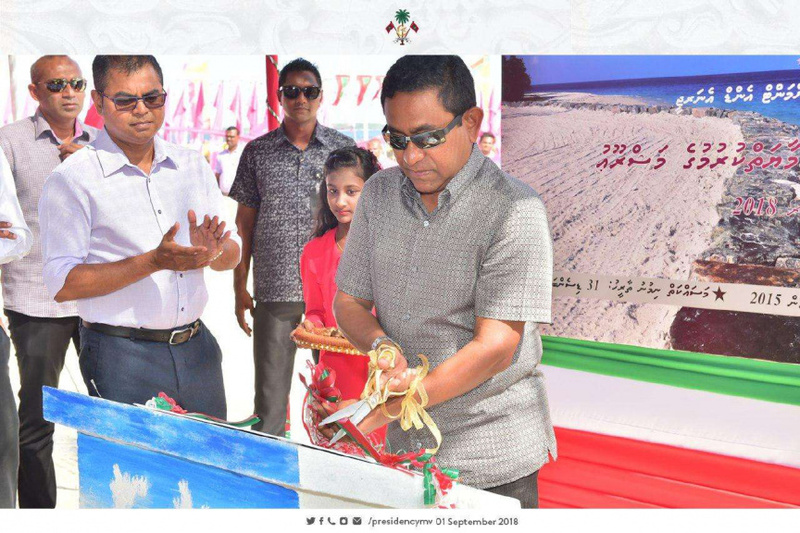 He participated in the function held to mark the completion of the Kurendhoo Coastal Protection Project, where he cut a commemorative ribbon and delivered a speech. The Kurendhoo Coastal Protection Project was contracted to Maldives Transport and Contracting Company (MTCC), which built a 220-meter long seawall to the South East of the playing field on the island. Yameen first stop during his Lh. Atoll tour was Lh. Naifaru. He visited the island last Friday and inaugurated the island’s harbor and the Lh. Atoll Hospital built on the island. The Naifaru Harbor Project was undertaken by MTCC, which enlarged the harbor area to 57,610 square meters. MTCC also built a 758-meter revetment wall, 783-meter breakwater and 3,640-meter pavement as part of the project. Yameen travelled to Lh. Hinnavaru later last Friday evening where he met with residents of the island. He is scheduled to visit Lh. Olhuvelifushi next.